When I started creating a website using WordPress, I had never heard the term Search Engine Optimization (SEO). On that time, I knew that building a website is not quite enough. Once you create it, the next step is to find a way to promote the website. In 2014, I believed that a word of mouth is the best way to advertise a website. I had no idea how to promote a website over the Internet. So, I searched on google about online marketing techniques, and then there were many ways to promote your websites, like SEO, SEM, SMM, SMO and much more. So, I read about that, How they can use and what is the difference between them. So, I am going to share you about their meaning and difference. Google defines SEO stands for search Engine Optimization Which helps to “Improve your Website’s ranking in organic results of search Engine”. It seems very simple, so, let’s elaborate more on this. Actually, it is a process to improve the visibility of a website to the audience on search Engine. In other words, optimization methods help to improve website’s visibility on a first or second page of search engine organic results. Newbie to SEO? Have a look at this Article. A difference between On-Page and Off-Page SEO 2017? Brief Introduction about Search Engine Marketing (SEM)? Most of the times, people don’t differentiate the terms SEO and SEM, they consider similar to both of them. Although these two have may very close origin and meaning. But, both are different from each other. Let’s check what Google defines the term of SEM (Search Engine Marketing). In some other words, SEM called as paid advertisements Google Adwords, Bing Ads any other methods of online advertising. It displays the click and impression measuring results and creates a campaign for advertising as well. You can set your budget and expect the return of investment. It is the fastest way to get your website display on the first page of search Engine results. The website results display as sponsored ads at the top of organic search engine results with help of keywords. At the End, if you are running your business website or blog, then create Social Media profiles on Facebook, Twitter, LinkedIn, Instagram, Pinterest, Reddit etc and share the content of your blog and website. In addition, you can add social media buttons on your website to share your website content on their social media profiles. As per the paid marketing strategy, SMM is similar to SEM that stands for Social Media Marketing. If you are familiar with Facebook ads, then you know that SMM is a quick action. With this paid advertisement process, you can increase your brand exposure and broaden your customer reach. What is Right Place for you? So, we have defined that SEO and SMO are two methods that you have to implement youself and other two methods SEM and SMM require paid advertisement according to the budget. 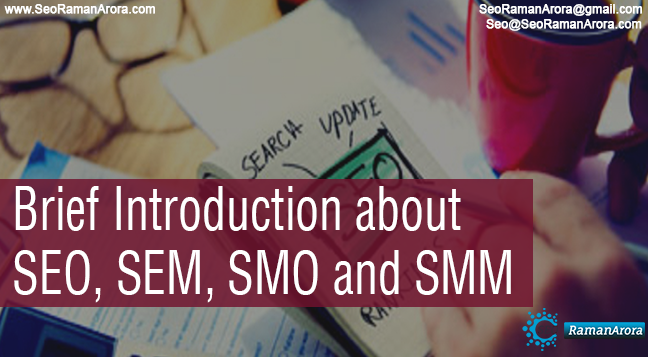 Although, SEM and SMM can provide you fast results, which are limited to the size of Budget. But, SEO and SMO are long time solutions, if you have done right, run your desired results continues for business growth. So, what is right for you? All of them depend upon business goals and quick results. If you like this blog, feel free to share it on your social media profiles or comment in the section below. Want to up to date with our latest posts on SEO, WordPress, Digital Marketing, Google and Earn money Online, then Sign up our Newsletter and Subscribe our Youtube Channel. Previous Post:Top 25 Off-Page SEO Techniques to Increase Your Website Ranking ! this is an informative article, will you please tell me how can I start my own blog? Thank you Sarah R. Welsh ! Keep Continue your reading and commenting as well ! Exactly. You did elaborate my statement. Thanks for such informative explanation and you look quite familiar with technical SEO. Cheers I like the definition you have used here although I am not sure that would enable remarketing to be included in SEM. Do you believe this is the indusrty accepted terminology?